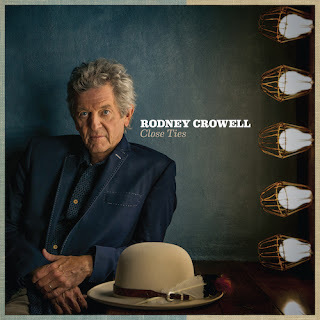 Retrospective reflective records are a likely domain for many seasoned artists, and Rodney Crowell has done just that with the release of his brand new album CLOSE TIES. As you would expect from an artist of this stature, the record is a classy effort perfectly capturing where he is as retiring years for normal folk beckons. Of course Crowell has graduated from pin up country star to one of the elder statesman of Americana music over the duration of a forty five year career mixing it with the genres’ elite. New West Records is once again the home of a Rodney Crowell release and this deeply personal accomplished collection reveals an artist in tip top shape. Three interesting thinking points cropped up during giving this record serious undivided attention: Does it work without understanding the context of a career? Can it reach out from Crowell’s admittedly large support base? Is there any potential to create a late career cult revival ala Johnny Cash? Taking the first question, this album is heavy in the contextual lyric department starting in chronological order with the distant nostalgic ‘East Houston Blues’ charting the turbulent nature of a childhood which was destined for life at the core of music. Industry name checking continues unabated especially in ‘Life Without Susanna’ (based on his love for the late Susanna Clark) and album finale ‘Nashville 1972’ (take your pick from the numerous country legends who greeted Crowell on his arrival to Music City many years ago). It is certainly recommended that you digest the lyrical content as it will immensely enhance the enjoyment of where this album comes from. However the strength of the production, sophisticated sound and elements of diversity will give the record credence to those who prefer to just take in the vibes. Promotional track ‘It Ain’t Over Yet’ and joint-favourite song with the closer ‘I’m Tied To Ya’ both contain heavyweight duets to spruce up the listening fare. Crowell’ ex-wife Rosanne Cash joins in on the first one alongside John Paul White, while Sheryl Crow adds an extremely evocative vocal piece to the latter. Overall the sound is generally a little gentler than some of his previous solo material, in particular THE OUTSIDER album from 2005, although ‘Storm Warning’ does lift the pace a touch. Without doubt fans of Rodney Crowell and his luminaries such as Emmylou Harris, Steve Earle and Rosanne Cash will lap up the contents of this record. Partly this is because his solo releases have been relatively light in number over the last decade, although his pair of duet records with Emmylou was met with widespread lauded acclaim. There is still a significant market, particularly overseas in the UK, who may be graduating to Americana music later in their listening music life and discovering an artist like Rodney Crowell will be an added boost. So with every one of his releases there is always potential to reach out to a new fan base. On the final point of a cult revival, this is probably a long shot on the back of anything truly radical or left field being missing. You never know, there might be a contemporary collaboration one day that might do the same that the American Recordings did for Johnny Cash at a similar age. This is far too conservative for that impact; a notion that wasn’t on the table when this album was being conceived. Anyway free from hypothetical pondering, CLOSE TIES is an album worth checking out regardless of the degree of your awareness and appreciation of Rodney Crowell. The rich song writing and music making go a long way to helping you understand why he has remained in the upper echelons of his profession for a number of years.